About 25 times a day our phone rings and the voice on the other end says something along the lines of “Hi, I’d like to book a rehearsal studio”. We always respond with “Ok, what date, what time, for how long and in which studio?”. As around 90% of our customers are regulars, the answer is along the lines of “Studio three, 14th December at five pm for three hours”. The other ten percent of customers, who are usually new, generally know the date, time and the duration of the session they want. What they don’t know is which studio would best suit their needs. About half will say “biggest/smallest or cheapest/most expensive available”. The other half will say “What would you recommend?”. We then ask how many people, what instruments, what genre of music. From this we try and guide them towards the room best suited to their needs. To help the process, our website has some pointers. The directory of studios on our website gives some helpful hints for the uninitiated. This is whether the room particularly suites a genre of music (studio three has guitar stacks suited to metal rock bands etc). It also recommends the number of people who can comfortably fit in. All of these are just guidelines for customers. 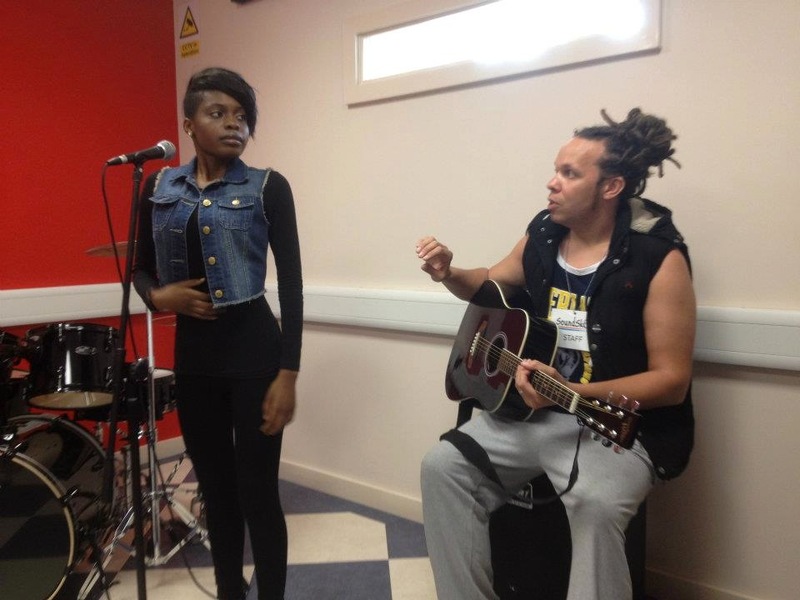 There are all sorts of articles which give advice on what to look for in a rehearsal studio. The problem with many of these is that the advice is so generic as to be almost meaningless. An acoustic guitar duo will have a totally different requirement to a full on six piece metal band. The size of PA systems in our studios ranges from 400 watts to 3Kw. A 400 watt mixer amp is absolutely fine for all acoustic acts and maybe the 50% of customers that do not need to play over pounding drums and feedback guitars. 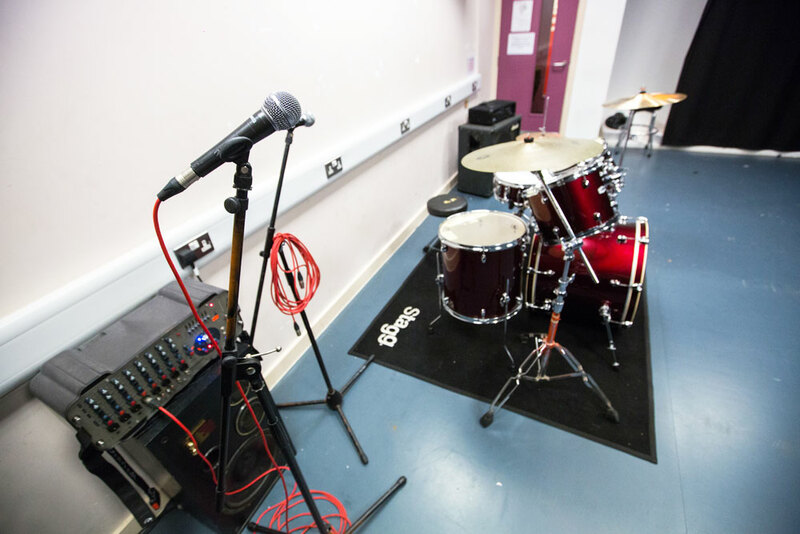 Our studios provide a PA system with mics (see individual room specs for details), guitar and bass amps and a drum kit. Generally the power output of the amps is matched to the PA.
One of the mistakes some bands make is to book a room solely on price rather than suitability for their music. We advertise all of the supplied equipment and it is well worth checking these. Often customers will try two or three different studios before finding the one which they feel most comfortable in. For example, Amy Winehouse probably rehearsed in every studio we had, but even when she signed a deal and was internationally famous preferred studio 9 as this was the one she felt suited her sound the best. 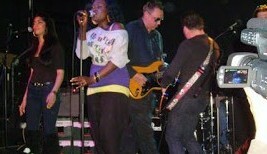 Likewise, The Damned will always book studio 7. as this has the loudest PA and the most space. Some artists, who work with different acts will select different studios. Alan Warner from The Foundations prefers Studio 16 for band rehearsals, as he likes the ambiance of the room for soul music and the comfort for working out complex arrangement, however when he’s rehearsing with his blues/rock trio he will use studio 10 as it is economical and they just want to blast through a few songs quickly to sharpen up. Six of our rooms (studios 14-19) are air conditioned. 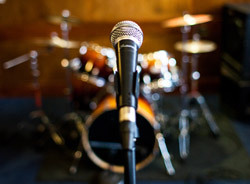 Musicians working on big projects find this is very suitable to their requirements, whilst bands on a budget and in a hurry often prefer the older studios in converted lock up garages. We always advise new customers to have a look at our website. This clarifies most of the issues and also has an on line booking and studio availability calendar. One of the biggest complaints we hear from our customers about certain other studios is that their websites do not clearly explain their pricing policy on the website. We often get asked questions such as “do the drumkits come with cymbals”. Mill Hill Music Complex has a policy that all a drummer needs is a pair of sticks. It is worth clarifying this as we’ve heard horror stories at other studios of being charged large amounts of money for decidedly sub-standard cymbals. Always ask the question, if you are unsure. Clearly if a drummer has a very expensive set of cymbals they will be superior to most standard studio sets. A big frustration for us is that occasionally customers tell us at the end of a session that there was a problem with an amp or a drum kit. If the session has finished, then it can’t be rectified. We have a whole stack of spare gear for just such occasions. Always tell us immediately and we will fix the problem if we can. Perhaps the biggest issue for customers is the studio session cancellation policy. Mill Hill Music Complex (along with most London studios) operate a 72 hour minimum notice for session cancellation. If you book a studio and cancel less than 72 hours before the start of the session, we charge the full fee (unless the studio is rebooked by another customer). We had to bring this policy in as customers were booking studios and simply not turning up. Like most studios, we run on a very tight budget. If customers do not turn up, then this means we are not covering staffing, rent, rates and other costs. Artists really need to ensure that they are organised. We have a policy that if there is a force majuerre such as a snow storm that disrupts traffic etc, we will waive charges, but if it is simply because a band cannot organise their affairs, then we have to charge. Strangely when bands make excuses, it often involves the death of the drummers grandmother etc. We’ve even had drummers turning up after other band members have cancelled on account of their grandma’s death (which has been a big surprise to them). Make sure you know a studios cancellation policy. In our experience, studios that don’t have such a policy are not professionally run and as such tend not to be around too long. If ever you have to pay a cancellation fee, bear in mind this is the price of keeping a studio running. As it is rare for all members of a band to be local to a studio, it is also worth checking out the local transport scenarios. Mill Hill Music Complex website has links to all local buses, tubes and rail services. Also checkout whether there is onsite parking and whether it is worth turning up early for a space! Give some consideration to the fact that you are likely to be in the studio for 3-4 hours min. Find out whether there are facilities for drinks and snacks. Mill Hill Music Complex has a full range of products in vending machines. If you bring food or buy drink, please be considerate and tidy the mess up afterwards. Often studios are booked back to back and it is not fair on incoming customers to be greeted with a wall of litter. Another consideration for bands is when you are auditioning, often musicians will turn up early and have to wait. Does the studio have a suitable waiting area? 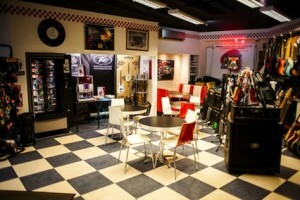 We have our 50’s diner themed reception area, with free complimentary wifi for all customers. When booking, think of other things you may need. Does the studio have free wifi available? we have it in our new studios (14-20) and in our reception area. We have clean, modern toilet facilities with full disabled access. We have guitars, basses and keyboards for hire if you have a problem with your instrument. We have strings, leads, plectrums and sticks for sale if you break or lose these. If you are booking a studio, it is worth checking out any reviews they may have. Mill Hill Music Complex has 150 reviews, most are five star, with an average of 4.5*. These tell you what customers really think. Bear in mind that people are often quicker to fire off a bad review than pay a compliment, so look for a general pattern. If five reviews draw attention to a particular issue, then it is probably genuine. If people leave good reviews, then that is usually a sign that a company is doing something OK. We’d also recommend that if you like a studio and they are doing the right things, you leave a review. That helps everyone.